If you are a fan of beet salads, you will love this ultimate beet salad with pistachio encrusted goat cheese. We love a good beet salad, and if you can make a good one at home, even better! 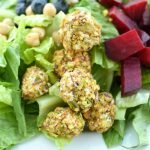 With a good citrus vinaigrette dressing, this Beet Salad with Pistachio Encrusted Goat Cheese is so flavorful. Roasting beets in the oven is such an easy mess free way to cook them because the skins just come right off! 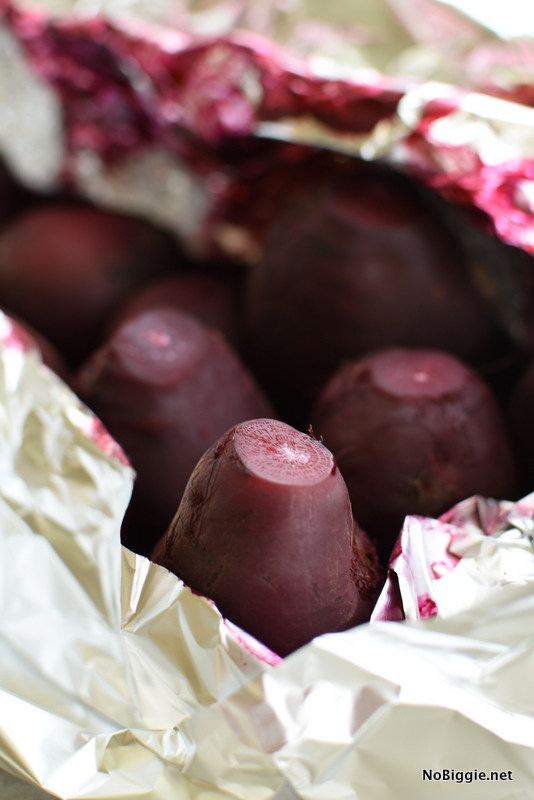 You can roast a small batch of beets in a tinfoil pouch. I love this method because if you’ve ever worked with beets you know it can be a messy job…the red color can stain your hands. We grew a bunch of beets in our garden this Summer and I loved this little one. It’s a true heart beet. Isn’t it the cutest?! 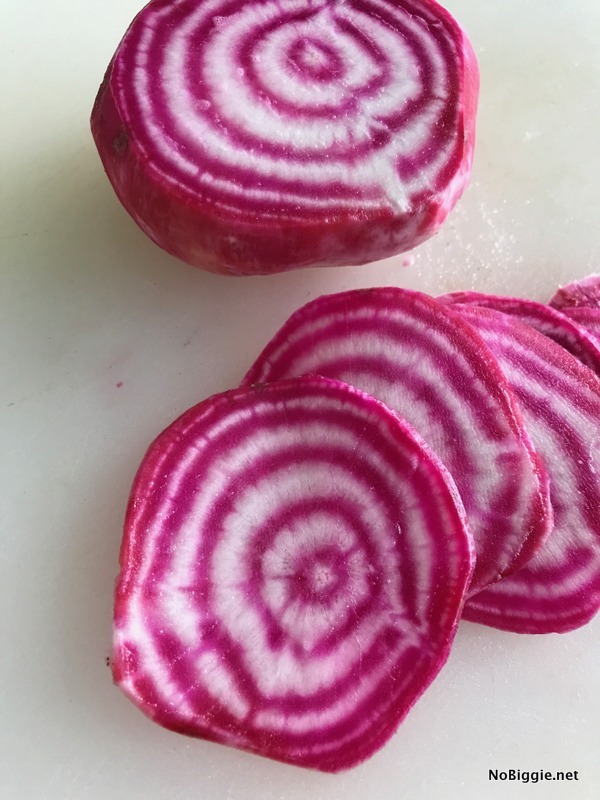 We grew striped beets and solid red beets. For the goat cheese, just crush pistachios and roll small ball shaped pieces of goat cheese in the pistachios to completely coat them. That’s it! I could eat these as is, don’t tell the rest of the salad. They’re so good! 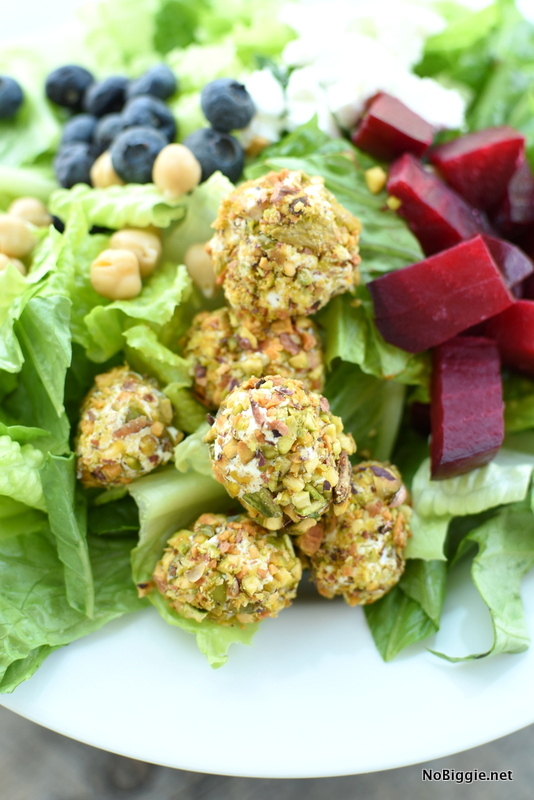 This beet salad with pistachio encrusted goat cheese is so good! Drizzle on a light citrus vinaigrette and you have a salad packed with flavor. Roast the beets: Preheat oven to 400. Line a sheet pan with foil and fold a 12- by 24-inch sheet of foil in half to form a square. Crimp two edges to form a pouch. Place washed, unpeeled beets into the foil pouch. Wrap the foil all around all the beets leaving a little spot open on the top for steam to escape. 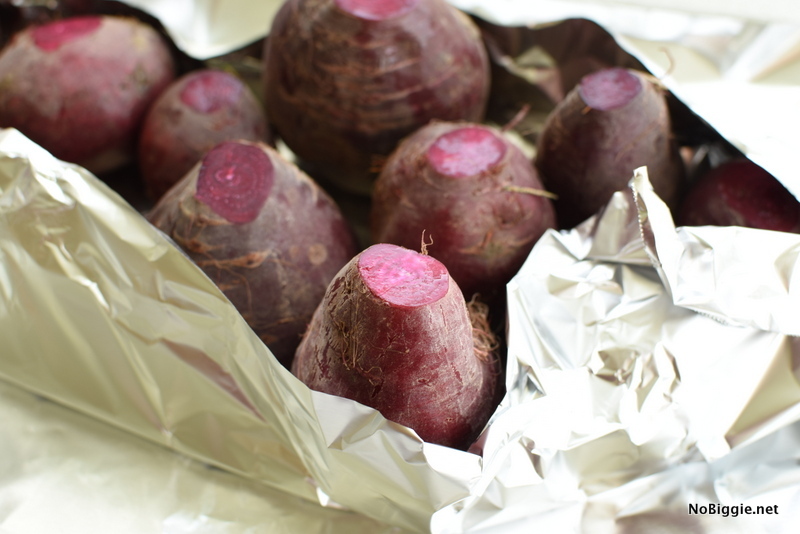 If roasting beets of different colors, roast them in separate foil pouches. 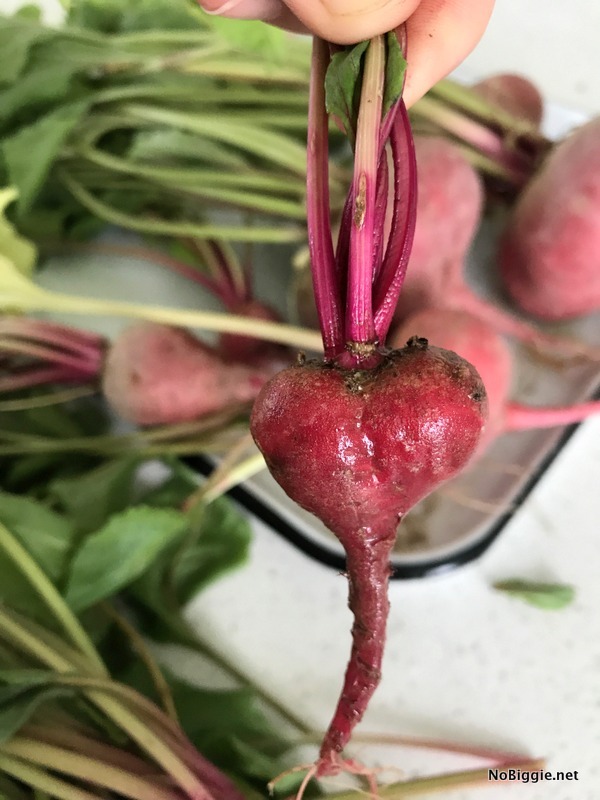 Roast until beets are completely tender, (about 1 hour), and a toothpick can be inserted with little to no resistance. Remove the beets from the oven and allow to cool completely. When beets are cool enough to handle, peel them by gently rubbing the skin under cold running water. Cut beets into chunks. Beets can be cooked and chill in the refrigerator for up to 1 week. Place the shelled pistachios in a small ziplock bag and gently crush with a rolling pin until lightly crushed but not totally smashed. Transfer half of the nuts to a small bowl and reserve the rest for a garnish. Roll small bite sized chunks of goat cheese into the crushed pistachios to form a crust. This is best done just before serving, as the nuts tend to soften in the fridge. Set aside. To make the dressing: Add the zesty lime Italian Vinaigrette with the orange juice concentrate. Mix together well. On a bed of chopped green leaf lettuce place the beets, blueberries, garbanzo beans and small chunks of goat cheese in group sections on top. Add the pistachio encrusted goat cheese balls just before serving. Sprinkle extra pistachios on top of it all. Drizzle the salad with the citrus vinaigrette. Season with salt and pepper to taste and serve. –Beet Salad on a stick! 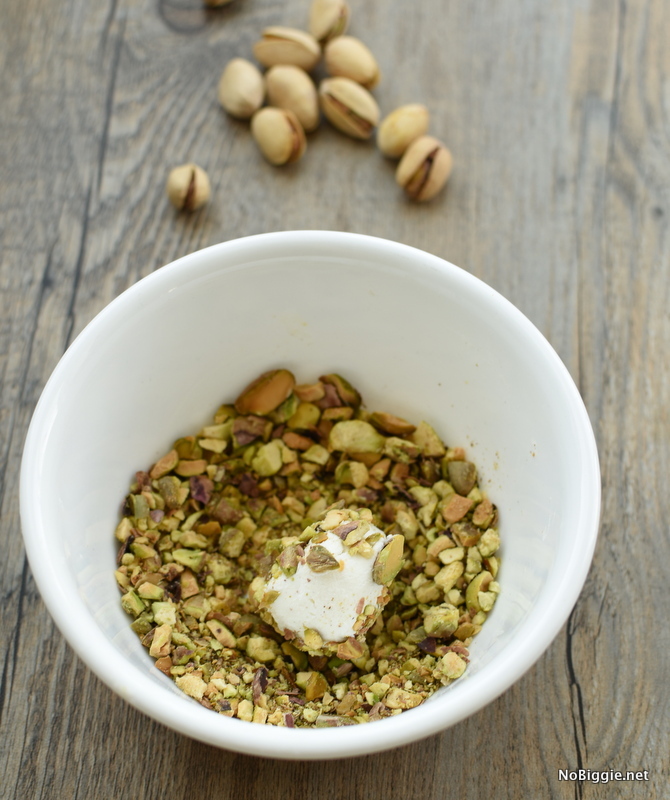 That goat cheese rolled in crushed pistachios is a Genius idea! I add one single drop of a concentrated liquid smoke to my goat cheese log from Costco but rolled in pistachios??!! !…I can’t make it fast enough. Dressing sounds divine, too. Thanks so much!! Ooh…yum! I’ll have to try adding that flavor! Sounds so good!